Home > Humor / Fun > Music > Something Missing This Christmas? As we enter this festive season, it seems as though there’s something missing. You feel it too, don’t you? It’s simply this: the Rolling Stones have never released an album of their holiday favorites. Who wouldn’t want to hear Mick warble a few spasms of Silent Night or Joy to the World? Okay, you may not be able to suspend disbelief to that extent, and I understand that. But what about some bluesy Stones-flavored Christmas makeovers? 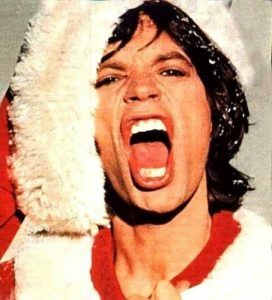 Here’s what I think a Rolling Stones Christmas album would look like.